Mychael Danna's Oscar winning score for Ang Lee's Life Of Pi combines incredibly disparate sounds to create an otherworldly feel - perfect for a movie that makes such a visually stunning impact. At the centre of Life Of Pi is Pi himself, a boy who has lost his family to a shipwreck and drifts aimlessly in a lifeboat. This opening lullaby gets us right into the Indian-influenced soundworld of the film, and also says something about our hero's innocence. Mychael Danna's score for Life Of Pi takes in a huge amount of disparate influences, from the Indian percussion and vocals of the OST's opening to this slice of louche French accordion. Pi, played by Suraj Sharma, hails from the Indian town of Pondicherry, briefly evoked with this theme. Ang Lee, director of The Ice Storm, Brokeback Mountain and Crouching Tiger, Hidden Dragon, is expected to walk away from Life Of Pi with a clutch of awards... and Mychael Danna's soundtrack has already been nominated for a Golden Globe. The movie's scenery is predictably stunning, and pieces like Christ In The Mountains make the visuals all the more stunning, here with subtle Indian percussion and gorgeous wordless vocals. One of the dominant elements of Life Of Pi (and one of the more surreal) is Pi's fellow lifeboat survivor - a Bengal tiger by the name of Richard Parker. Here, he is introduced for the first time in the score. Mychael Danna's soundtrack for Life Of Pi features a number of key musical interludes, and this reflective little piece is no exception. One of the film's key characters, Ananda, is introduced with this theme. In the movie she's played by Shravanthi Sainath. Much of the film is told in flashback, as we see various different points in Pi's life. Consequently, Mychael Danna's soundtrack has to veer from different moods to accommodate and enhance the visuals - this is a perfect example. Another atmospheric number, this time with deep horns and shimmering strings, ideally suited to the film's dazzling visual approach. French actor Gerard Depardieu makes an appearance in Life Of Pi as a chef - we can't guarantee he's anything to do with this track, though, which is an achingly sad piece led by a super flute melody. Suraj Sharma, who plays Pi, was given lessons in seafaring survival as part of his preparation for the role - this piece, with its hauntingly high vocal line, sees him put it into practice. Part of the movie sees an adult Pi telling his story to a writer, played by Rafe Spall. The character of Pi is, in flashback, constantly bullied and victimised - something Mychael Danna's evocative score does well to bring out, especially in this track. Can you see both Pi and Richard Parker in this nifty bit of artwork? This section of Mychael Danna's score does the same thing, drawing together both of these characters in their tricky buy crucial relationship. One of the directorial flourishes in Life Of Pi is when Pi encounters a whale at sea. Danna's score is extremely deft at capturing that same sense of wonder, with its delicate opening gradually building into atmospheric layers of strings. Danna's score suggests that, while Richard Parker is obviously a formidable beast, he can be trained. The numerous flashback sections of the film tell Pi's back-story, including that of his father, played by Adil Hussain. We start to reach some sort of resolution in the score now, as with the film's narrative. The storm calms, and that familiar flute comes back to usher in a more assured, confident sound. Animals form a huge part of Life Of Pi, and they're often depicted in a unique fashion, like these meerkats. For Tiger Vision, though, Danna uses that familiar Indian flute to evoke a very particular atmosphere. As the title suggests, the epic storm depicted in the movie is reflected completely in the score. Huge cymbal crashes and almost mournful strings are at the forefront here. 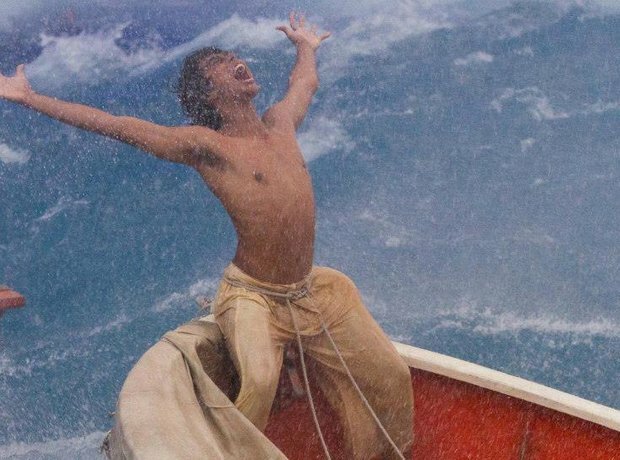 We don't want to give anything away, but this climactic point in Life Of Pi is beautifully brought to life by Mychael Danna's music for The Island. Burbling percussion and soft strings are the name of the game here. This is by far the soundtrack's longest section. Consequently, it has far more range and suggests much more about how the movie's climax relates to the characters. In the film's flashback sequences, an adult Pi tells a writer (Rafe Spall) of his adventures. One of the key themes in Life Of Pi is storytelling, and a choice between two stories forms the film's final passages. And so concludes Mychael Danna's score for Life Of Pi - this final section describes the choices that certain characters have to make at the end of the film, winding down with ethereal voices.